Several changes have been implemented on Chapman's campus in an effort to reduce water consumption over previous years in light of California's worsening drought. We have reduced our use of power washing to clean buildings and sidewalks, installed native drought-friendly landscaping, as well as retrofits in on-campus housing, and put in a weather-based irrigation system around the dorms. The positive effects of these changes can be seen tangibly in comparisons of water use from this year versus the previous two years. For more details on the drought efforts taking place, see our Drought Projects. 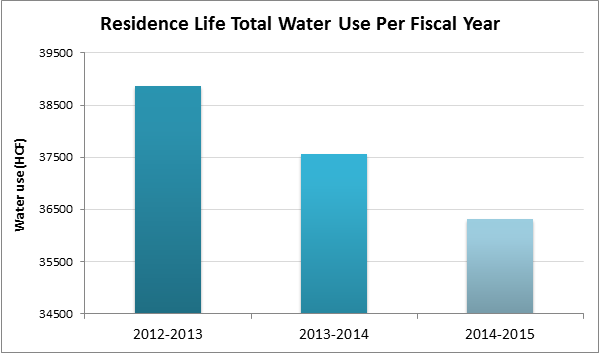 The majority of Chapman's on-campus housing has show significant levels of improvement in their water use reduction over previous years. The chart below demonstrates the effects of the changes being made in our buildings. The dorms included in these numbers are Henley Hall, Pralle-Sodaro Hall, Glass Hall, Sandhu Residence and Conference Center, and the Davis Apartments. There is a 6.5% reduction between the 2012-2013 fiscal year and the 2014-2015 fiscal year, showing a consistent drop each year. Marion Knott Studios, home to Chapman's Dodge College of Film and Media Arts, is one of several buildings on campus that have seen significant water savings when compared to previous years. 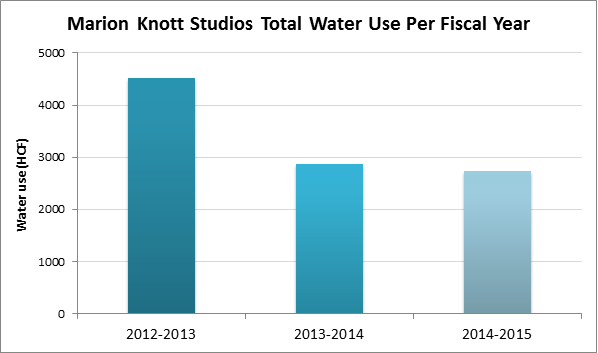 It has seen a 40% reduction in hundred cubic feet (HCF) used per fiscal year between the 2012-2013 fiscal year and the 2014-2015 fiscal year, as shown in the chart below. Last month alone, it used 16% less than it did during the same period last year. These decreases can be attributed to new native plants being installed on the 3.6 acre lot housing Marion Knott Studios, along with other conservation measures. Most of Chapman's water consumption comes from the main campus located in Orange. The combined buildings have demonstrated a decrease in use consistently over the past few years. 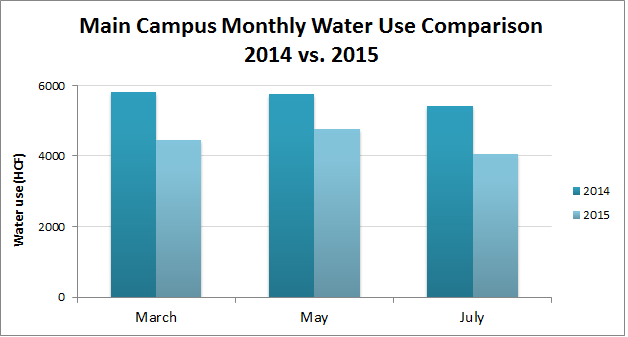 Some significant drops can be seen in the chart below, which shows the water use during certain months in 2015 compared to the same time period last year in 2014. The numbers shown in this chart only take into consideration the water meters in buildings and not irrigation water meters.